Images courtesy of Jennifer Celio. Local artist Jennifer Celio will represent Southern California and Long Beach in the National Museum of Women in the Arts (NMWA), Organic Matters – Women to Watch 2015 exhibition opening June 5. Celio will fly to Washington, D.C. on Wednesday to take part in the show’s opening reception. On view until September 13, the exhibition will explore the relationships between women, art and nature through the eyes of contemporary women artists’ complex views. Through a wide array of mediums, including photography, drawing, sculpture and video, the featured works display fragile ecosystems and inventive landscapes within a larger commentary about women’s relationship with nature, according to the NMWA exhibition announcement. This series of exhibitions presents emerging or underrepresented artists from across the country and around the world. The release said that NMWA curators selected 13 artists from this group. Image of NIMBY (national forest). Celio has been living and drawing in Long Beach for the past 11 years. Most recently she was awarded The City of Los Angeles (C.O.L.A.) Individual Artist Fellowship in 2014 and the Pollock-Krasner in 2012. 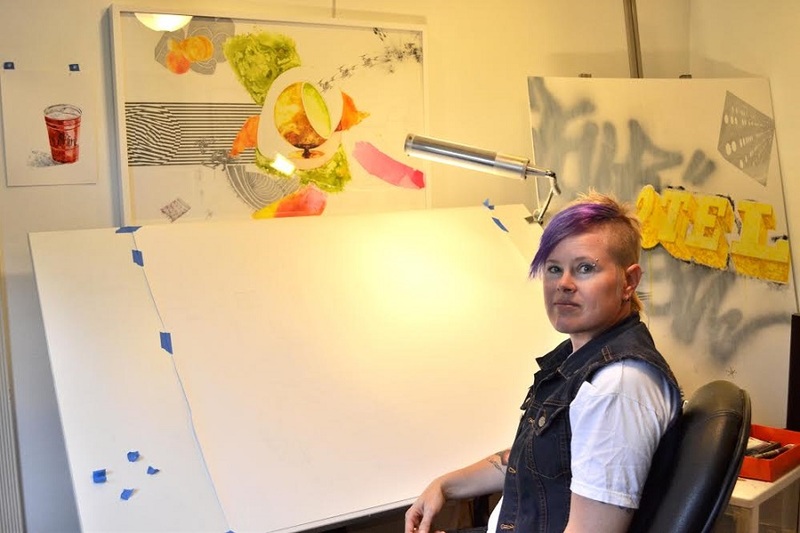 Locally, she was awarded the Arts Council for Long Beach Professional Artist Fellowship in 2010 and was included in the exhibition Sweet Subversives: Contemporary California Drawings at the Long Beach Museum of Art in 2009. 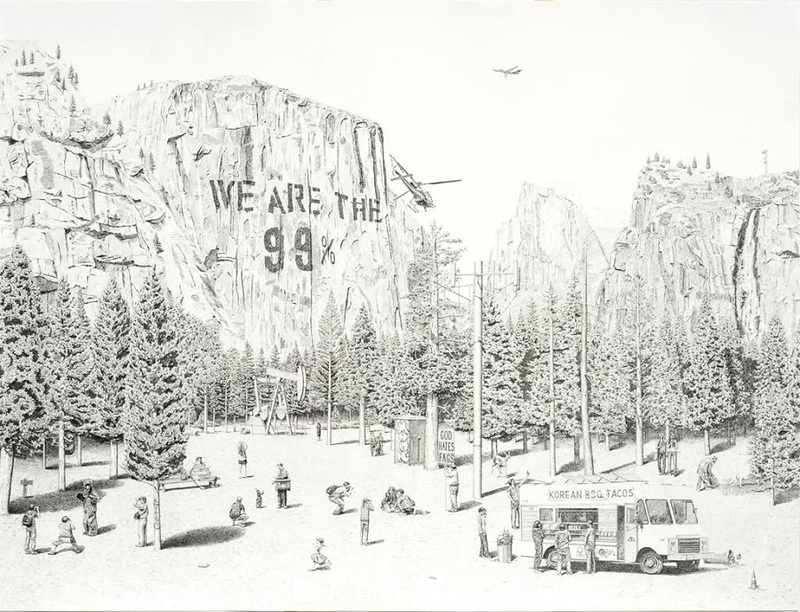 The two pieces she will show in the NMWA exhibit are a part of her NIMBY (Not In My Back Yard) series of drawings, which play upon the term coined within the environmental movement for a “desire to hide away, out of sight, certain technologies and necessities of civilization for the convenience of a few,” Celio said. When describing her work to the Post, Celio said that “humans often miss the power of nature while focused on capturing their own experiences. “Park visitors take photos of a person in a bear suit while ignoring the bear cub climbing a tree in the background, and other representative people of American society take in the setting while seemingly ignoring the oil drills, litter on the ground, and the odd ball fringe elements,” she said. 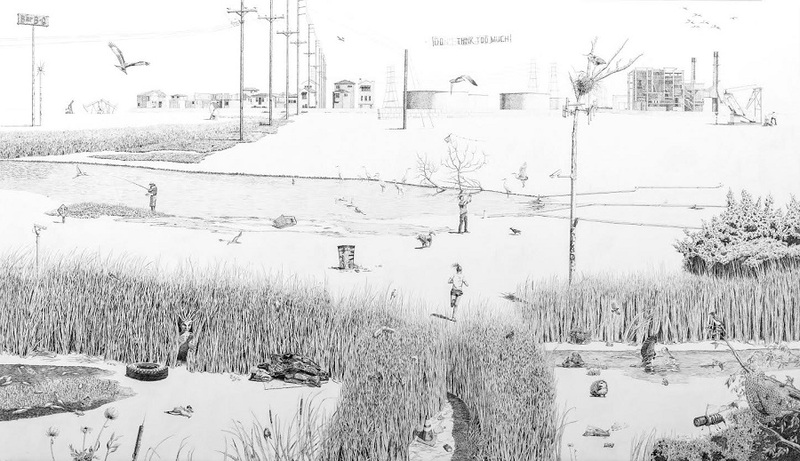 Pulling from her visits to the wetlands of Huntington Beach, NIMBY (wetlands) took Celio nearly a year to complete. One of the myriad minute elements within her work is the hive of buzzing robotic bees confronting the issue of collapsing beehives, an image requiring a close-up view in order to absorb. “After reading about prototypes of robotic bees and their potential use for pollinating crops if honeybees go extinct, I just knew they had to appear in one of my drawings,” she said. Celio puts her pencil to paper with the dream that humans may actually be capable of reconnecting with the natural environment that surrounds us always, rather than taking it for granted. In her artist statement for the exhibition, Celio reaffirms her commitment to exploring technology’s effect on nature. You can find out more about Jennifer Celio’s work by visiting her website here. For more information about Organic Matters – Women to Watch 2015, click here.